One cannot begin to associate celebrating and enjoying Philippine summers without going to—or even thinking of—beaches. 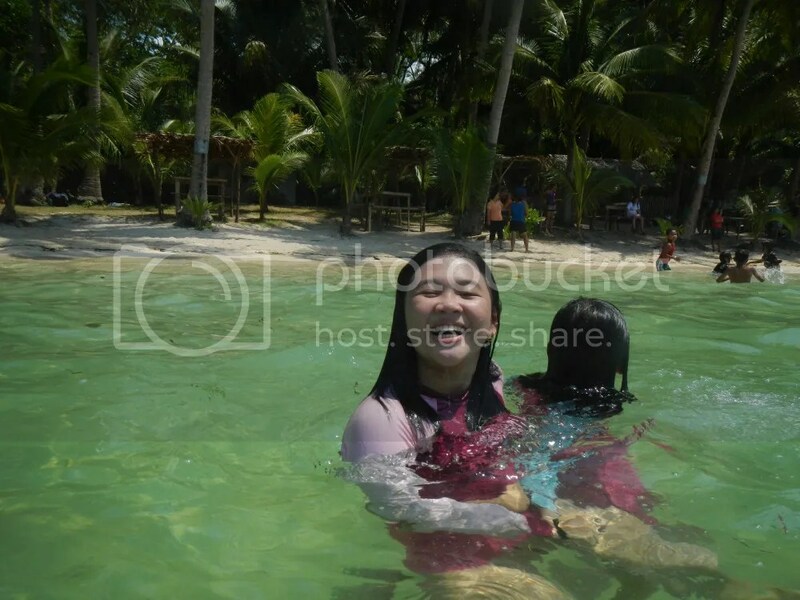 Indeed, summer in the Philippines is not complete without frolicking in crystal-clear seawater, playing on the sand, having a picnic of puso and barbecue under the shade of a hut or coconut tree, snorkeling above coral reefs, or even taking a walk along the seashore. You may actually have glimpses of these beaches in postcards, magazines, travel websites, and TV shows. But if you notice, many of these featured beaches also feature immaculately maintained gardens, massive hotel and resort buildings in the background, relaxing beach lounges, carefully trimmed palm trees, and uniformed staff bringing drinks and coconuts with little paper umbrellas. While these kinds of beaches may appeal to the ordinary tourist, these leave much to be desired for the adrenaline-seeking adventurer. Thus, while an ordinary tourist enjoys all those convenience, pampering, and ultramodern facilities, the adventurer finds himself or herself asking: where are the boundless white sand shores? Where is the azure, aquamarine water? Where are the tropical fishes that nibble at your feet? Where is all that serenity offered by a place devoid of people, buildings, and monumental costs? In other words, where can I find real Philippine beach paradise? Worry not. 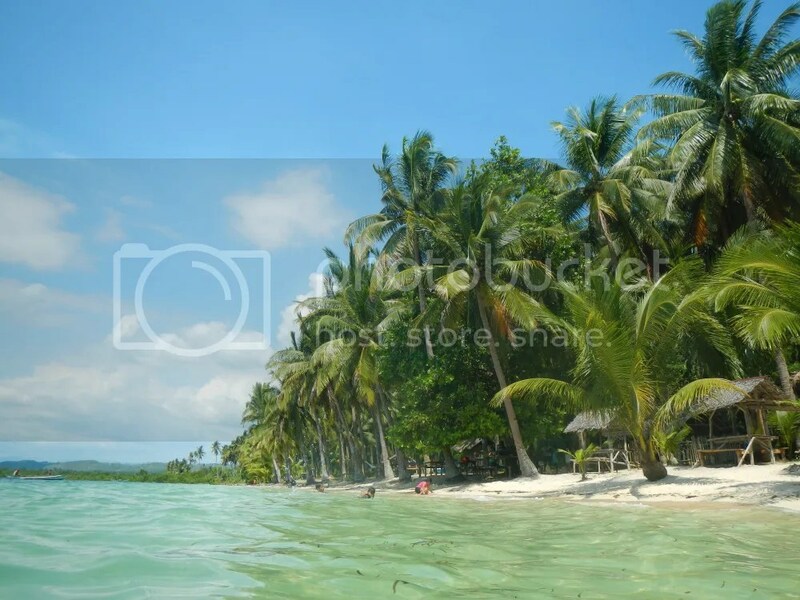 The Cebu Province consists of 167 islands, all blessed with some of the finest beaches in the world, each with its own unique characteristic. 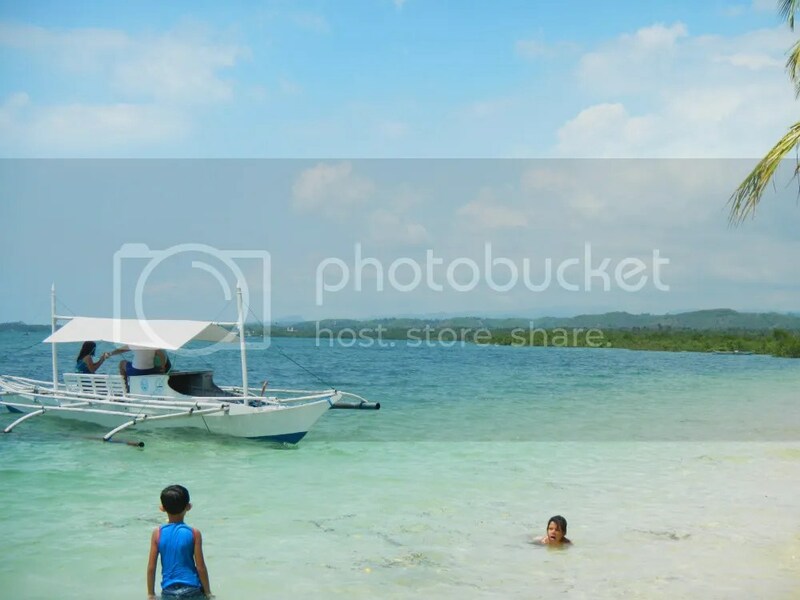 And in the municipality of Aloguinsan, Hidden Beach is considered by locals and visitors alike as one of place’s best tropical paradises. It is humble yet teeming with the grandeur of nature. It has the natural gifts that are present in postcard perfect, world-class resorts without the presence of modern conveniences. 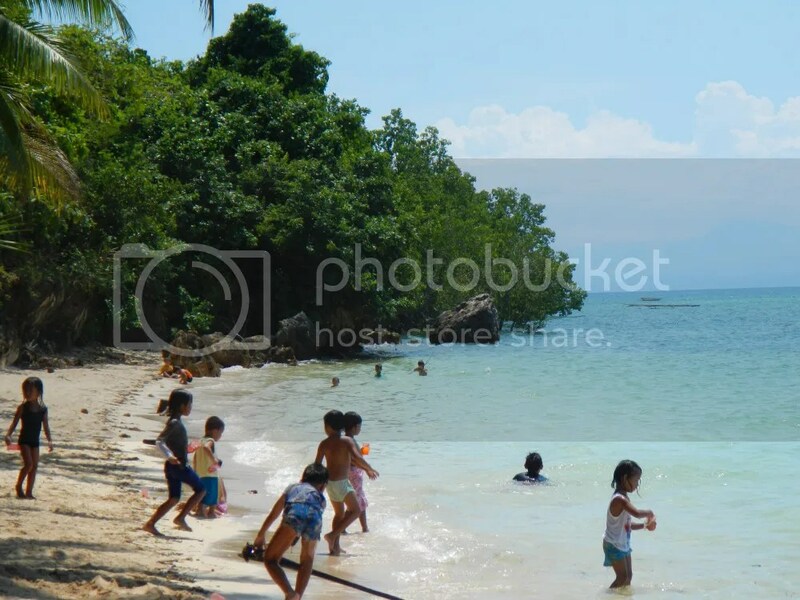 Put in another way, it is the epitome of pure, simple, classic beaches in Cebu. 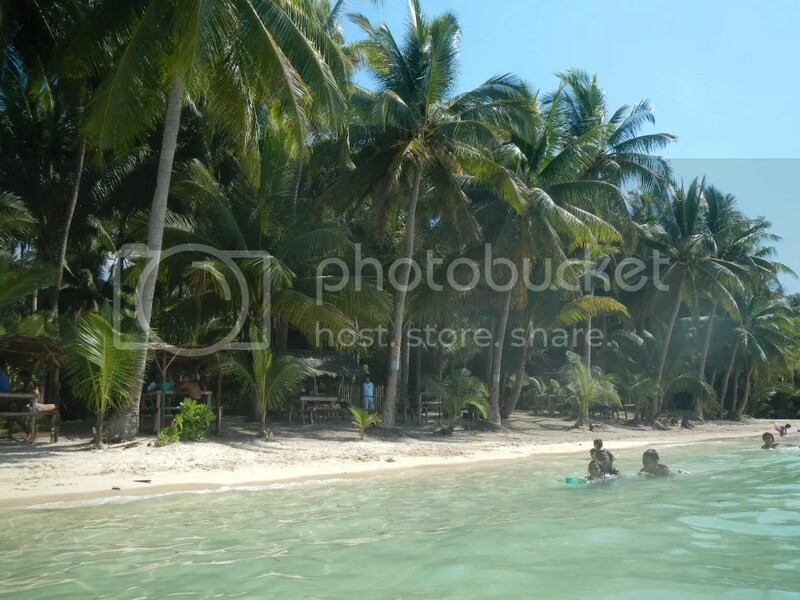 We visited Hidden Beach after we had our river cruise in Aloguinsan. Sweetie and I decided to end our weekend with a refreshing dip at one of Aloguinsan’s treasures. 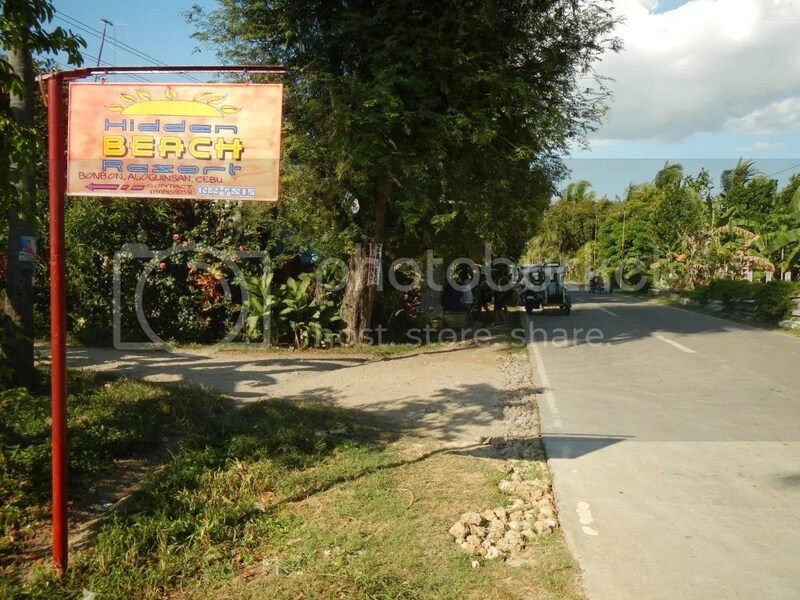 After a 20-minute habal-habal ride from the Bojo River trailhead, we saw this sign beside the highway. Hidden Beach, here we come! You may want to buy your softdrinks and snacks at the store across the sign. Products and supplies are way cheaper when bought outside the resort. A short but bumpy ride after, we arrived at the entrance of Hidden Beach. We guess that it named aptly so because the resort is hidden behind a thick grove of trees. Welcome to Hidden Beach. The trees, which offer plenty of shade, made us really feel welcomed. Well, who wouldn’t? At this time, midday, the sun’s heat was simply oppressive. 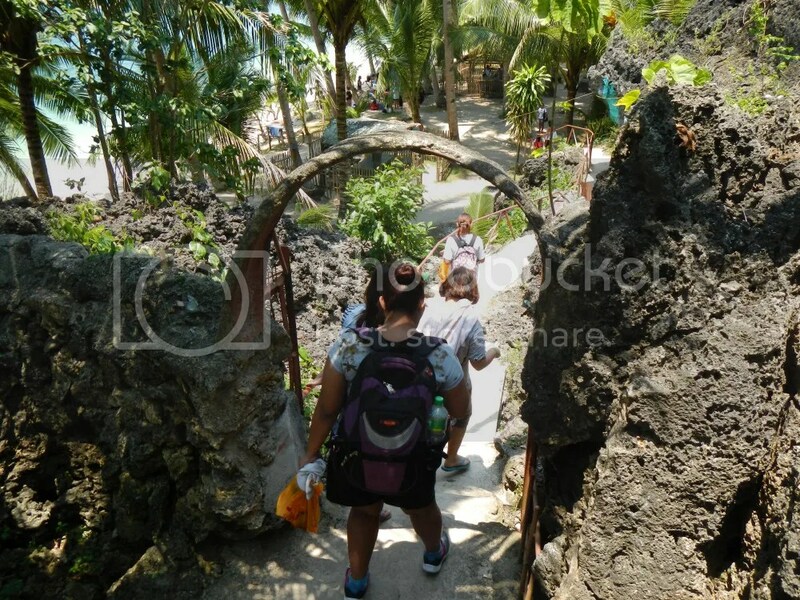 After everyone was accounted for, we headed to the fenced entrance of Hidden Beach. Very provincial entrance sign. Check out the roughly drawn sketches of a hut and boat. “If you avail AND any facilities”? And that should be valued customers. Hehehehe! 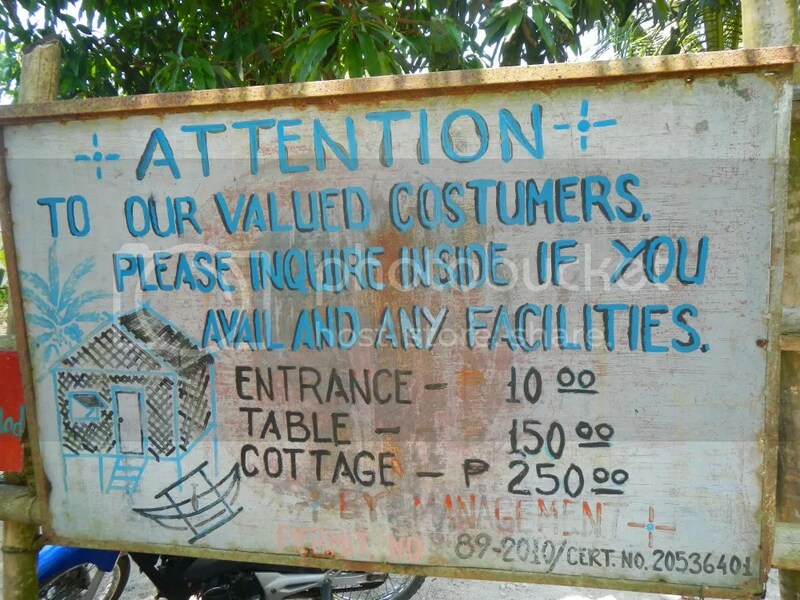 To ensure that guests won’t forget the fees, signs, both tasteful and less than mediocre, are posted on the gate. You’re not getting anywhere without paying the fee. But at least, the rates are very affordable. After paying the entrance fee (we didn’t pay for a cottage or table since we just agreed to simply sit down at a shady part of the beach), we proceeded to the shore. 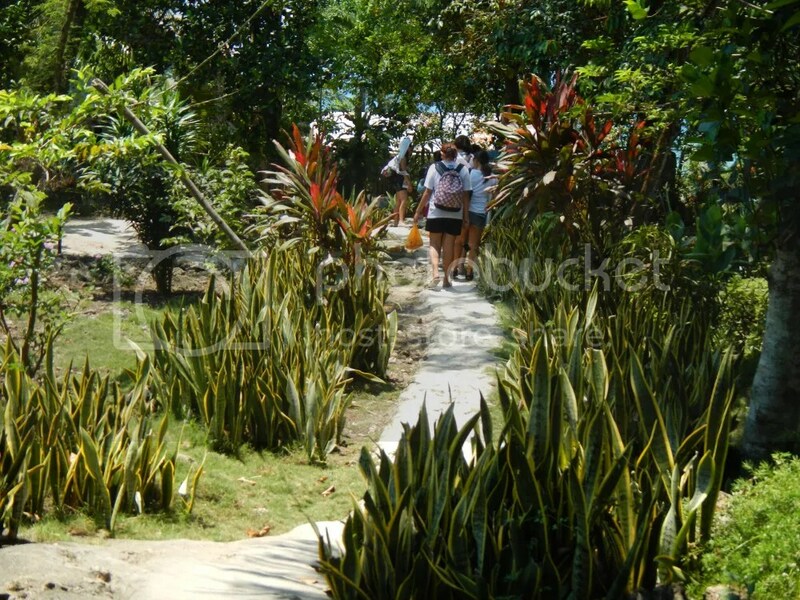 For a public beach, Hidden Beach’s surroundings are beautifully manicured. Not overly manicured like in overly classy resorts, the beach’s gardens are quite pleasant and refreshing, a “warm-up” refreshment for the real thing. 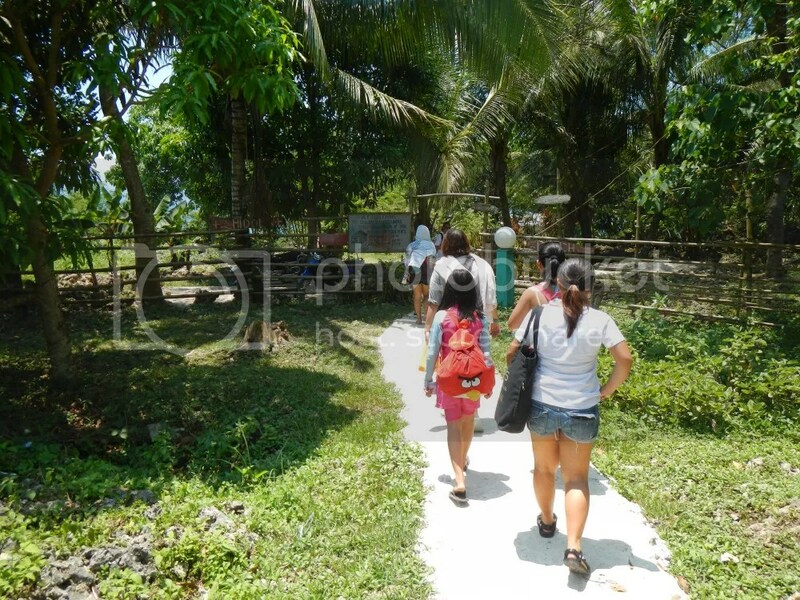 On our way towards the shore, we saw the vast and blue expanse of Tañon Strait. Wow! A stone arc serves as the gateway to the shore. There are plenty of large canopied trees that can provide plenty of shade. That’s why we didn’t spend extra for cottages and tables. 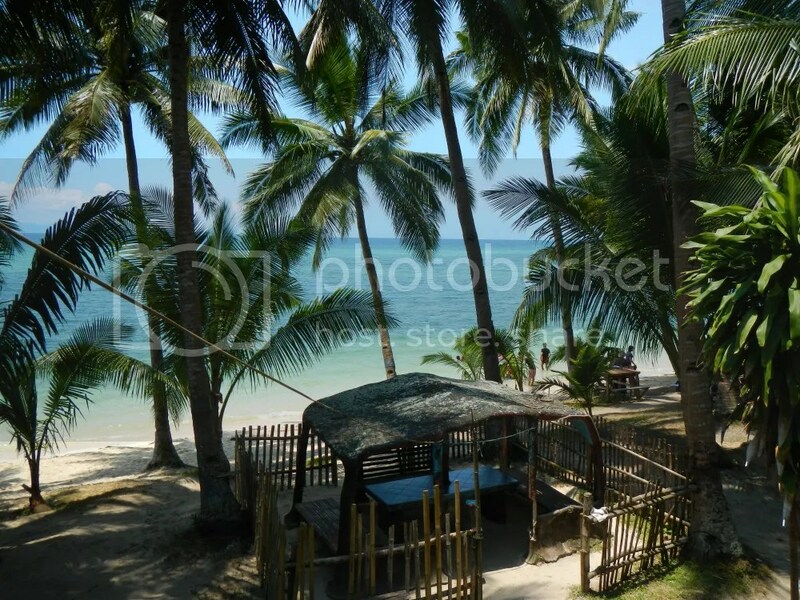 That’s an example of an airy P250 cottage, which provides an encompassing view of Tañon Strait. Look at all those shady palm trees! Plenty of greens just in front of the shoreline offer plenty of shade. The ground is relatively flat so that it would be easy for people to simply lay down their picnic mats. 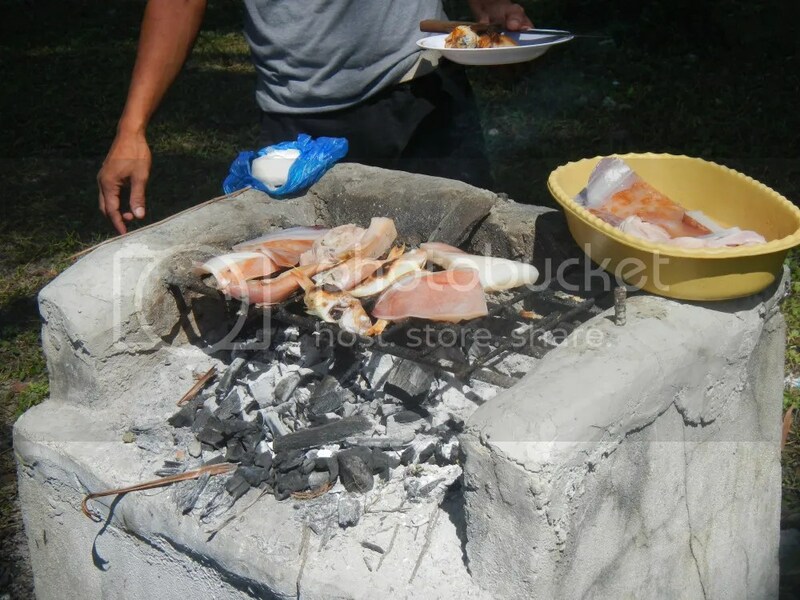 Grilling and barbecuing foodstuffs to perfection is a staple activity in any beach outing. Hidden Beach provides several grilling stations for this purpose. You have to buy your own supply of coal though. Mmmm! Can we have some, sir? The fragrant, smoky smell can definitely make your mouth water. Lunchtime! The others bought lechon manok and rice. Sweetie and I, ever the thrifty couple, brought something homemade: deep fried salted pork slices and sautéed mushrooms. We were so excited to take a refreshing dip that eating lunch just took less than 10 minutes! Then it was time to take a dive in! But first, don’t forget to wear your bathing suit or swimming trunk. And don’t forget to slop on sunblock with an SPF rating of at least 35. That’s one of the tables for rent at P150. The kids were the first to dive in! 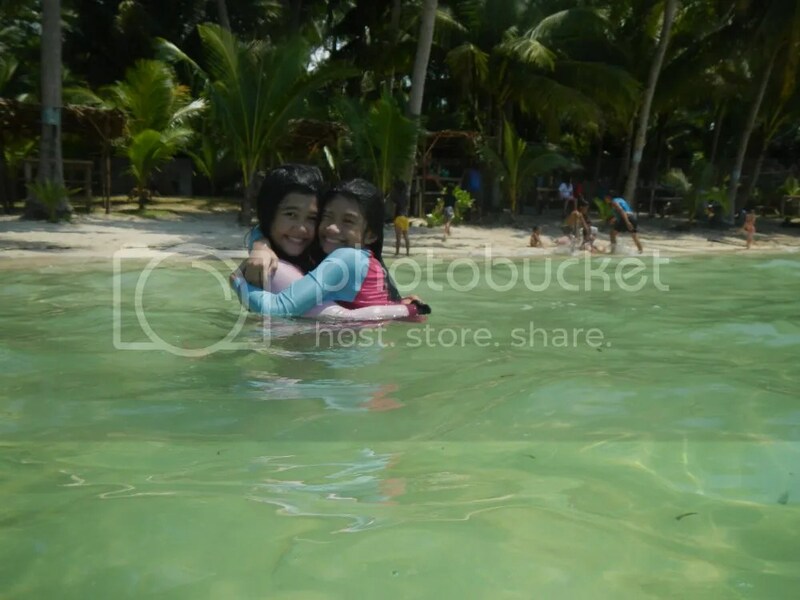 Alexa and best friend Lei enjoyed the water so much that they hardly went out of the beach until we announced it a day. At the end of the day, both girls were definitely tanned. Sweetie and I bonded with the little girls on a perfect summer afternoon. Underwater shots from our new camera! Pretty cool! 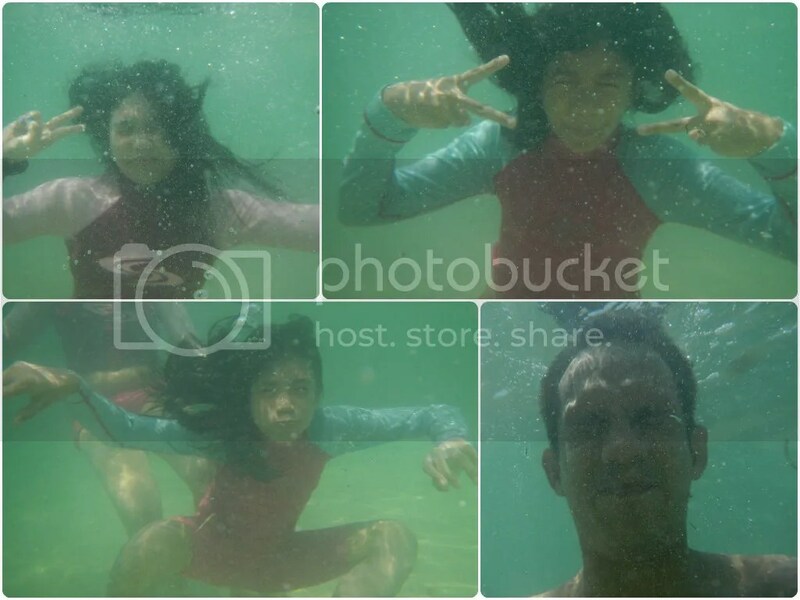 Sorry we can’t open our eyes underwater. A nice head-on view of the beach. Notice that unlike other beaches, there are no structures on the shoreline itself. 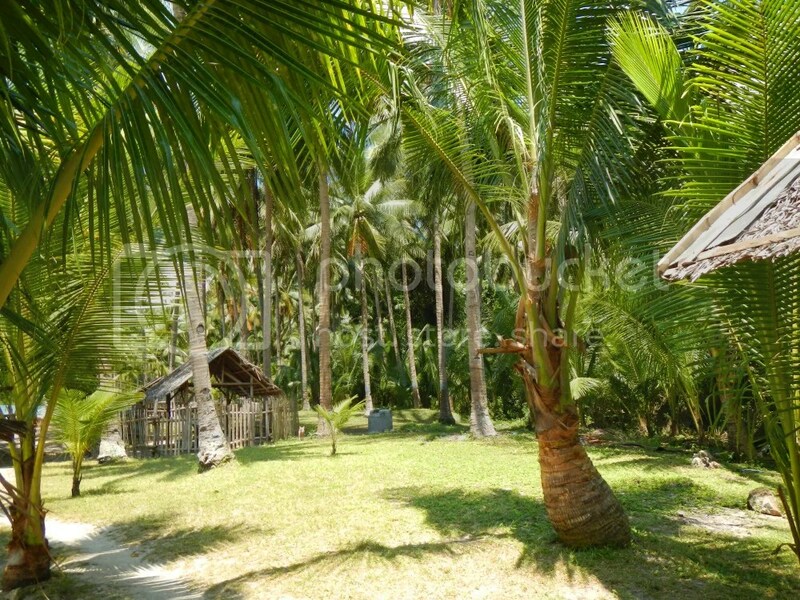 All the cottages and tables are nestled under shade of coconut trees. The absence of structures on the shoreline makes the beach look neat and clean. 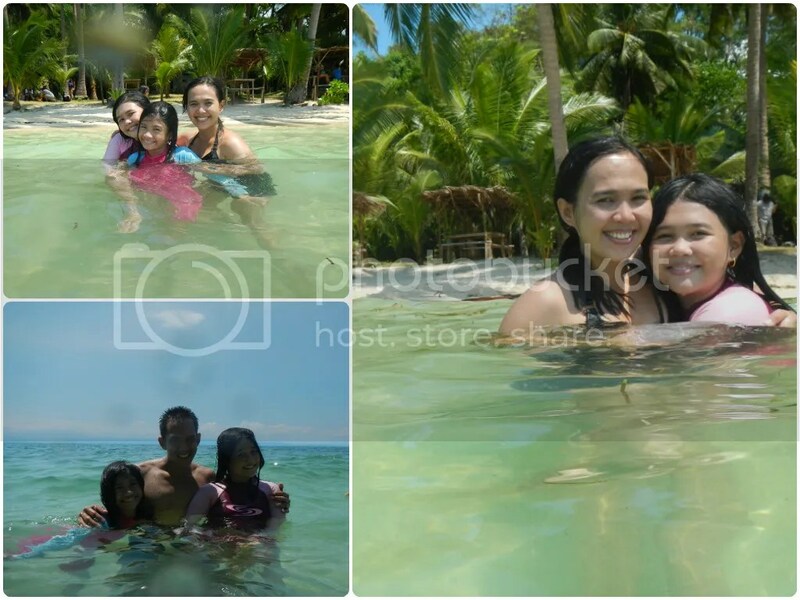 Locals and visitors are thoroughly enjoying the cool water and warm sand. 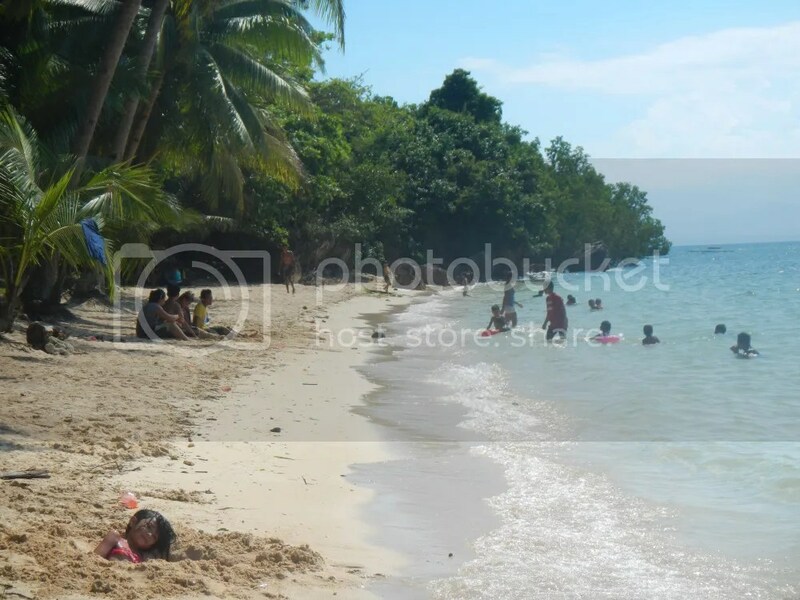 Check out that little girl who buried herself in the sand. Farther down south are some large rock outcroppings. We’re pretty sure that locals hunt for crabs and shellfish here during the night. Also, notice the absence of ugly seawalls that usually demarcate private and commercial beachside properties. 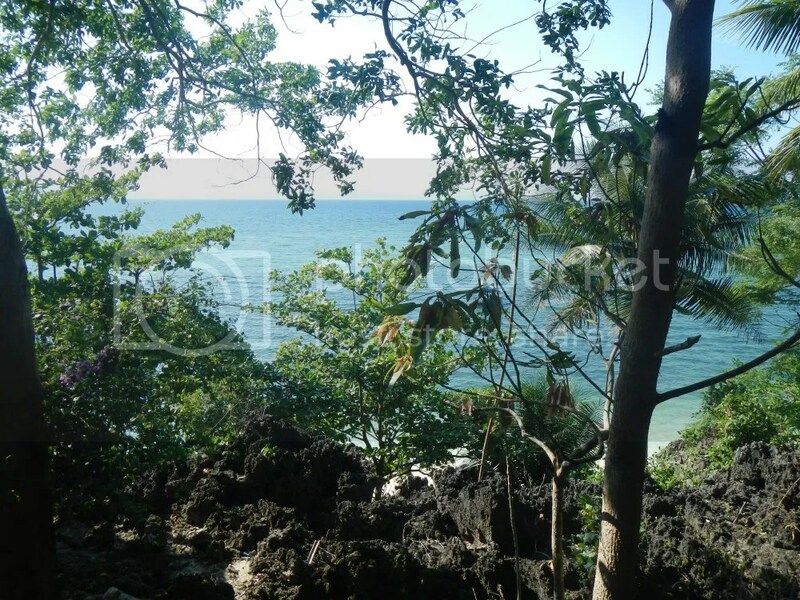 Unsightly seawalls are commonly seen in the beaches of Mactan Island. 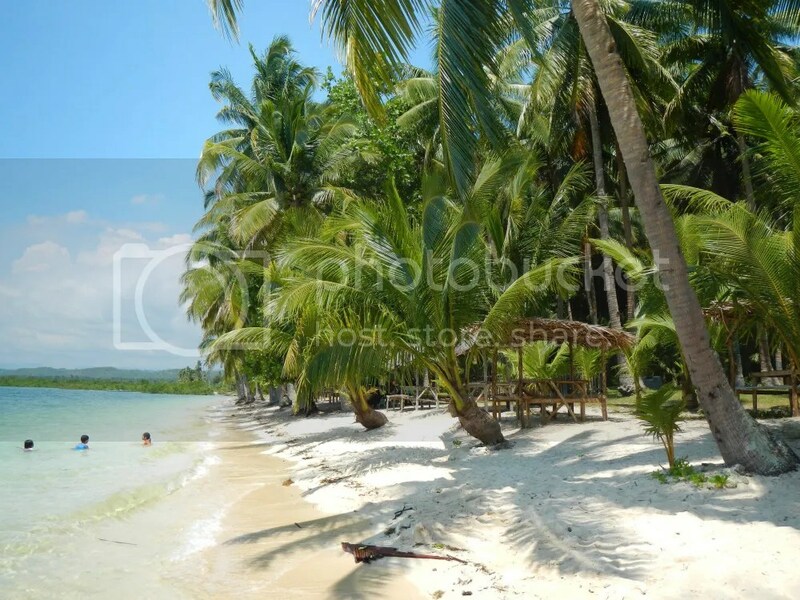 Here’s the northern side of the beach, facing Pinamungajan and Toledo. That is a clean and lovely coastline. Again, there are no unsightly, man-made seawalls to obstruct the long, sandy shore. In our own opinion, beaches shouldn’t have any seawalls. 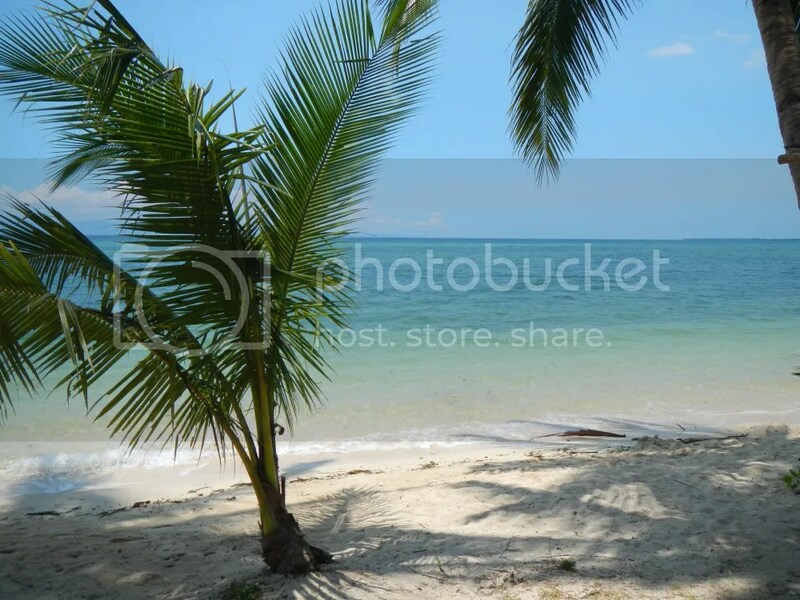 Palm trees beside the shore offer natural “umbrellas” if bathers need respite from the sun’s heat. A shoreline of clean, unspoiled, fine, white sand is one of Hidden Beach’s treasures. It’s so comfortable to just bury your feet in the sand or spread a beach towel and lie on it. It’s definitely paradise here. 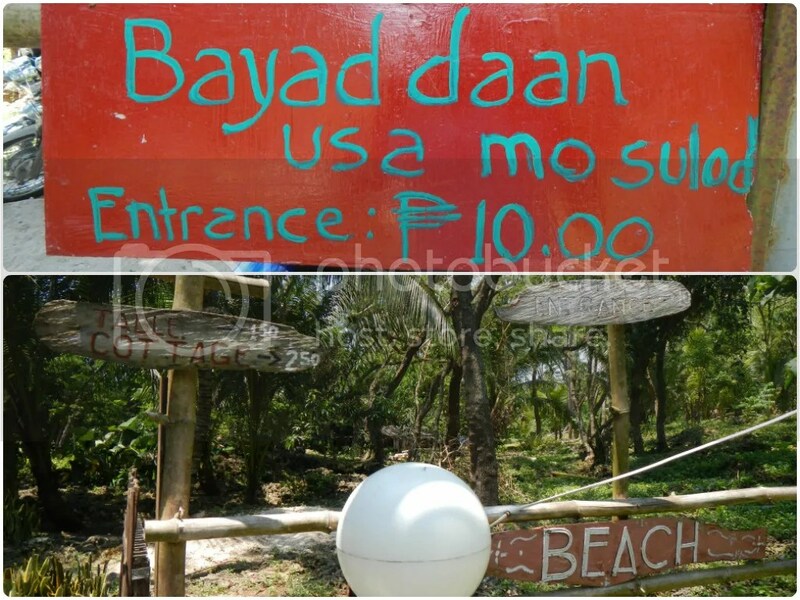 Locals said that the sand in Hidden Beach is “original.” This means that Hidden Beach’s sand is not extracted and hauled from some other place such as Bohol or Leyte. Do you know that the white sand in many high-end beach resorts are actually hauled from some other place? Yes, the shores in such establishments do look nice but at the painful cost of environmental damage at the place where the sand was quarried. Furthermore, by covering the place “artificially” with sand, the ecosystem that originally thrives in that area is severely harmed or even destroyed. 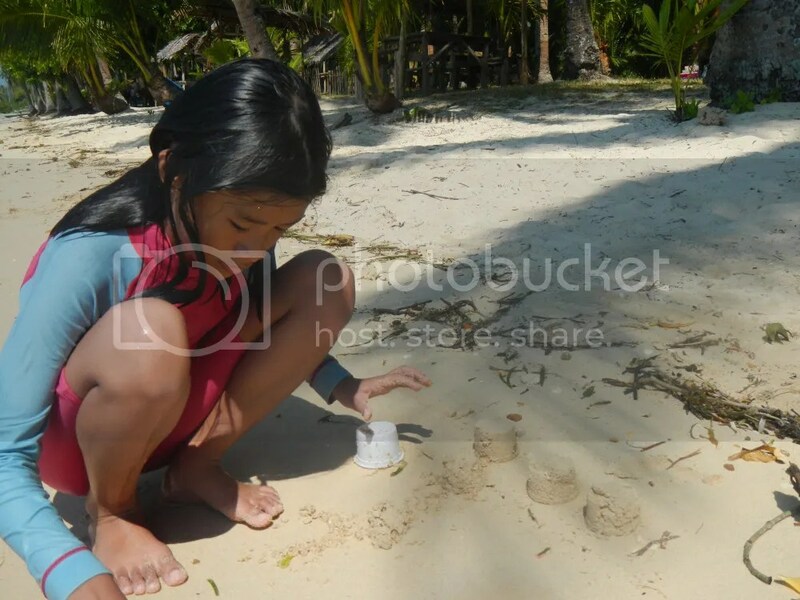 Lei tried to build a sand castle. Or is it something else, Lei? The fine, easy-to-sculpt sand here provides children with a natural “toy” that beats any toy in the department store. This cool outrigger vessel, a motorized banca, transports scuba-diving enthusiasts to Tañon Strait’s numerous, protected, and well-preserved dive sites. That’s the vast, serene expanse of Tañon Strait, which separates the islands of Negros and Cebu. Just look at that! That isn’t ordinary water; it’s an enchanting, glowing, liquid lapis lazuli! 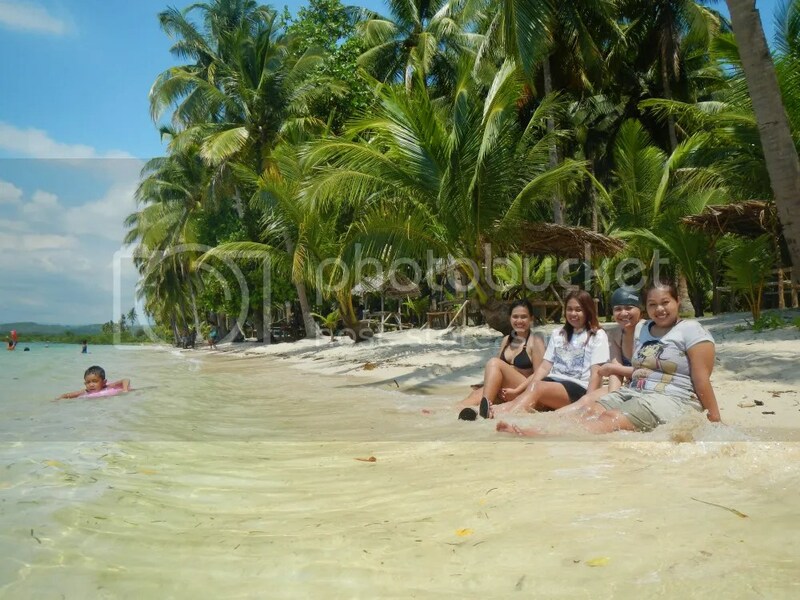 This is why tourists and locals alike can’t get enough of Philippine beaches; our beaches are simply magical. That is also why we should protect our shores and marine resources; remember that our incredibly beautiful marine resources are major tourist come-ons. 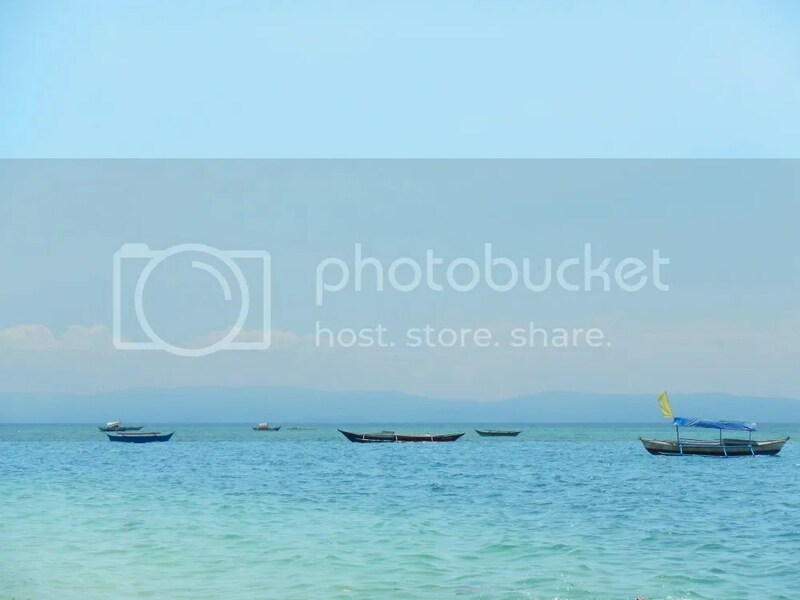 Tañon Strait is very abundant in marine resources. These fishing boats are a testament to the richness of the sea’s bounties. It was a fine day to have a swim. It was a Sunday, but the beach wasn’t crowded at all. Could it be that because it’s well-hidden as its name implies? Hidden Beach, for us, is an adventurer’s sanctuary. The Duders, all writers, were my ex-officemates. We’re still really great friends, and we surely enjoy each other’s company, especially in adventures like these. For Kristine and Dannea, this is their first time going on an adventure with Team Sweetie. That’s Sweetie with the rest of the Duders. 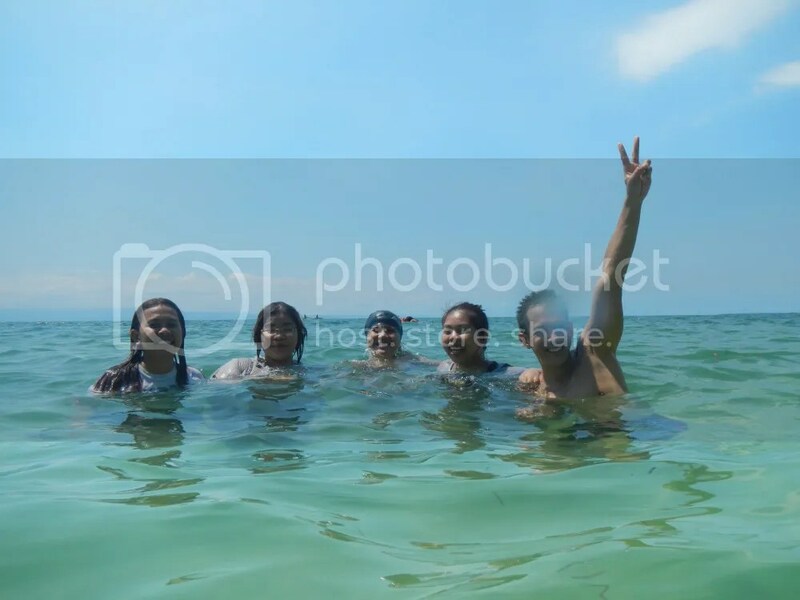 Since all of us have long, stressful jobs (just imagine sitting in front of your computer, brainstorming for ideas to write, writing them, making sure that keywords are strategically placed, and editing them 8 hours a day for 5 days a week), we surely need much-deserved breaks like this every weekend. No adventure—be it rock climbing, mountaineering, beacheneering, caving, wall climbing, kayaking, river cruising, etc.—is complete without bonding with my Sweetie. One of the goals I have forever tried to accomplish is to take perfectly timed jump shots. I was never successful in any of my shots until now. Dannea shared to me a fail-proof technique. These jump shots look great, don’t they? Around 3 PM, we had our fill of tranquil Hidden Beach. We hiked back to the highway for 20 minutes. We were back under the mercy of the scorching sun. It was one of those times where we wished we brought an umbrella. After reaching the highway (and a liter of sweat later) and waiting for 10 minutes, we boarded a passing jeepney that was headed for Toledo. Finally, we boarded a bus that will take us back to Cebu. Everyone, even the hyperactive kids, were spent and tired. 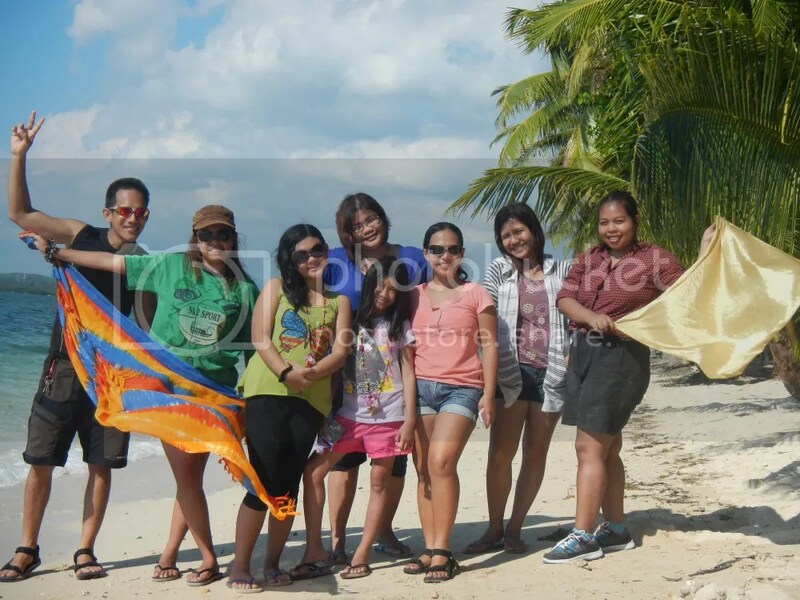 But, definitely, we were all smiles, exceptionally happy for taking part in an adventure-filled weekend. Congratulations to Alexa, Lei, and the Duders (Dannea, Kristine, Muffins, and Lillian)! Let’s have more adventures. Update as of 7/13/2015: The two contact numbers listed in the blog posts are no longer working. 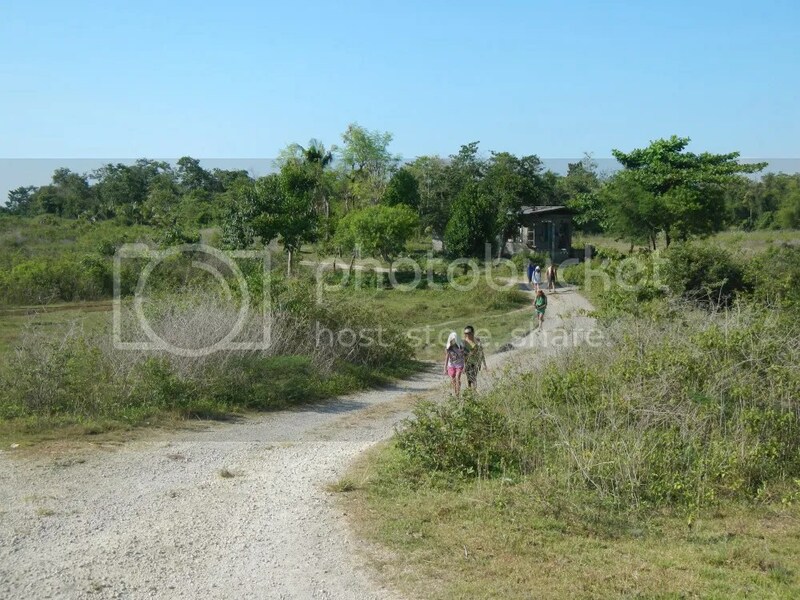 But don’t worry because the dirt road leading to Hidden Beach is easy to spot. Besides, you can always ask the locals and habal-habal drivers. Everyone there knows where Hidden Beach is. 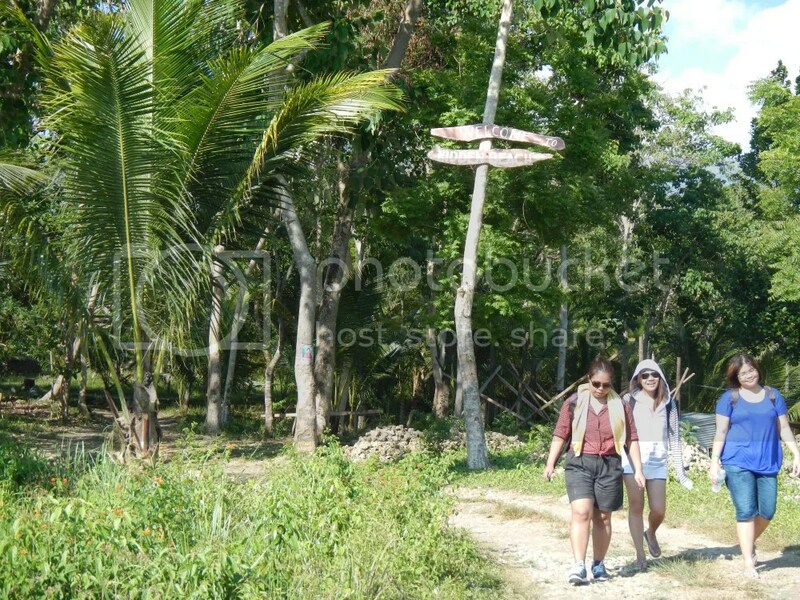 * If you want to include the Bojo River Tour in your Aloguinsan adventure, you may use the itinerary in the previous post. 1. For reservations and information, you can get in touch with Ate Baby at 0939-476-0912. 2. If you’re coming from Toledo, the Hidden Beach sign will be at the right side of the road. Just tell the driver to drop you off at the crossing of Hidden Beach. 3. 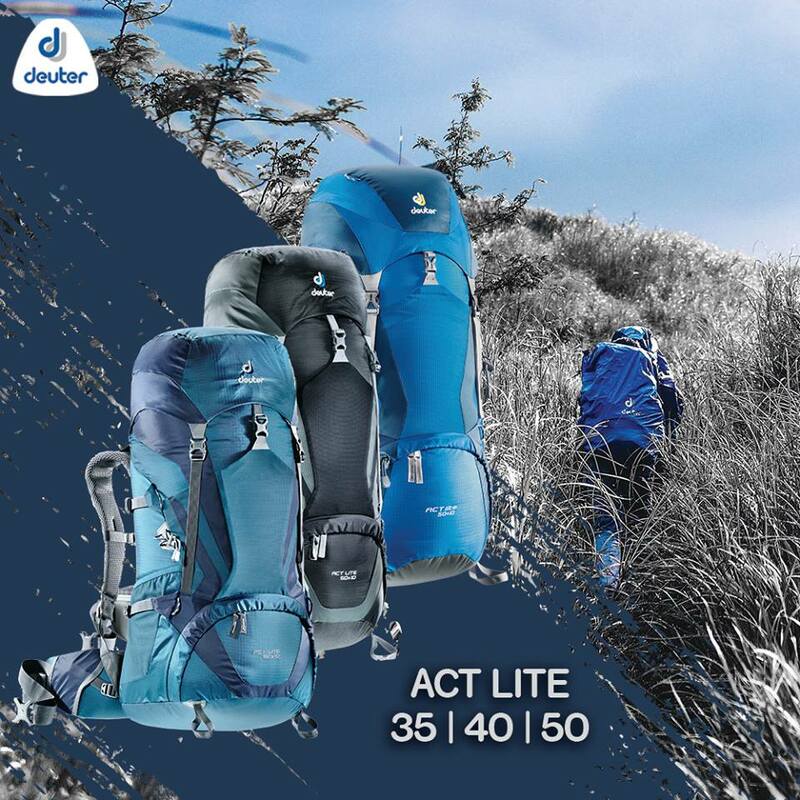 We recommend bringing your own lunch packs, buying your meal in town beforehand, or buying the ingredients beforehand and cooking them right at the beach. That’s because there aren’t any carenderias or restaurants in the area. Not even an in-house resort restaurant. 4. 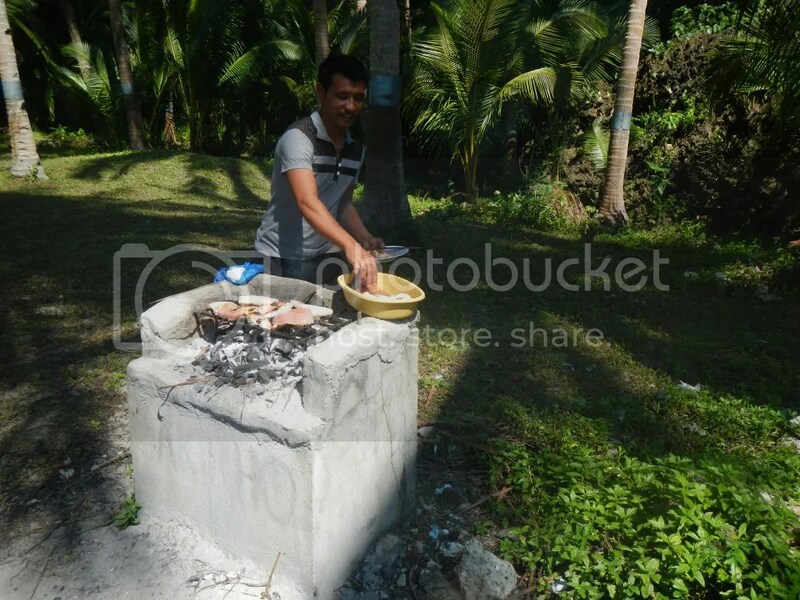 Ate Baby said that her staff can cook meals for you for a minimal fee. However, this is somewhat a misnomer. It means that they will cook the ingredients you brought with you. You can also ask Ate Baby to have their staff purchase food for you from the town proper. Of course, this will entail an extra fee. 5. When grilling food, use the grilling stations, which are located all around the shaded part of the beach . We encountered a group who grilled their barbecues right on the grass near a main pathway. Their action is not only detrimental to the environment but also poses a danger to passersby. That is truly bad etiquette. 6. The resort has meager facilities. There is only one store full of overpriced merchandise (another reason it’s better to buy everything you need outside the resort) that has a karaoke machine. Comfort rooms are shared. 7. 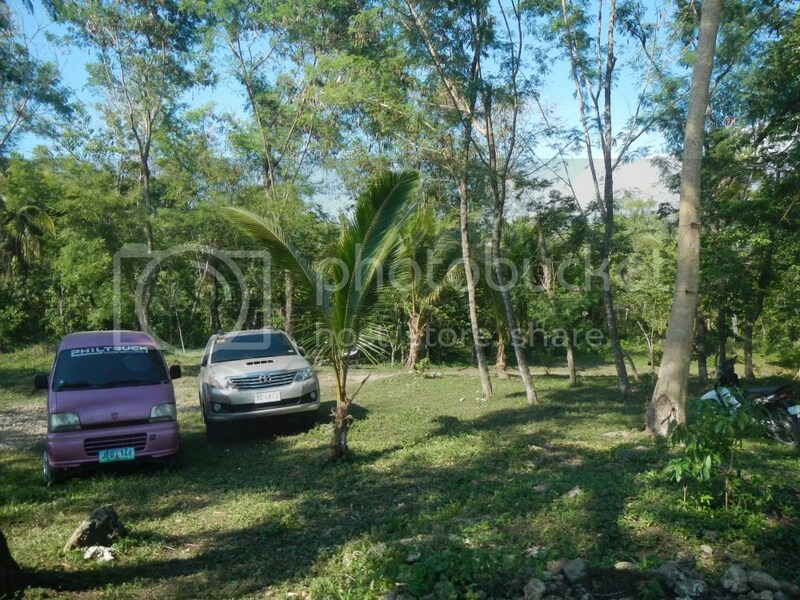 For overnight stays, there are huts that are available for rent at P500. But if you have a penchant for adventure (and if you’re trying to save money), why not pitch a tent at the beach? 8. 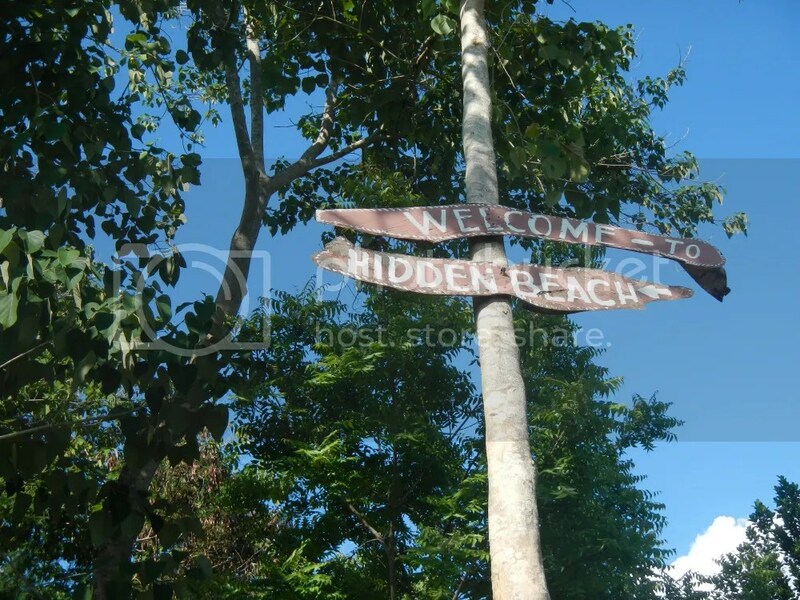 Hidden Beach has ample parking space, so you don’t need to worry about finding a parking space for your vehicle. 9. There are designated garbage disposal areas around the beach, which are actually piles of garbage that will be burned up later. We highly recommend not throwing your garbage on these piles since we don’t know how they dispose of trash other than incineration. It is better to bring your garbage with you and dispose of it in proper trash receptacles when you reach Toledo or Cebu City on your way back. 10. A few stray dogs may find their way to your picnic area, table, or cottage. Be sure to cover your food tightly in Tupperware, Lock and Lock, or similar containers. Do not rely on putting food on plastic bags and hanging them. These dogs have a penchant of reaching the bags and ripping them out to get the food inside. What an informative blog. Thank you. I’m so excited to go there with my family. Patrons who wish to stay overnight there usually pitch tents or rent open-air cottages. However, we did recall that they have rooms for rent. Hi. Good day. Is there rooms for rent overnight fine? I mean Is it comfortable enough? heheh Thank you. It has been quite some time since we’ve been there. There were rooms for rent at Hidden Beach when we visited there. We won’t know about the comfort because we haven’t tried. Most people who wish to spend overnight just pitch a tent or sleep in the cottages. hi! thanks for the info…very informative post…hoping the beach is still as unspoiled now as it was then when you wrote this. btw, how far from the parking space to the beach? The parking area is just at the entrance of the beach. We do hope so too. 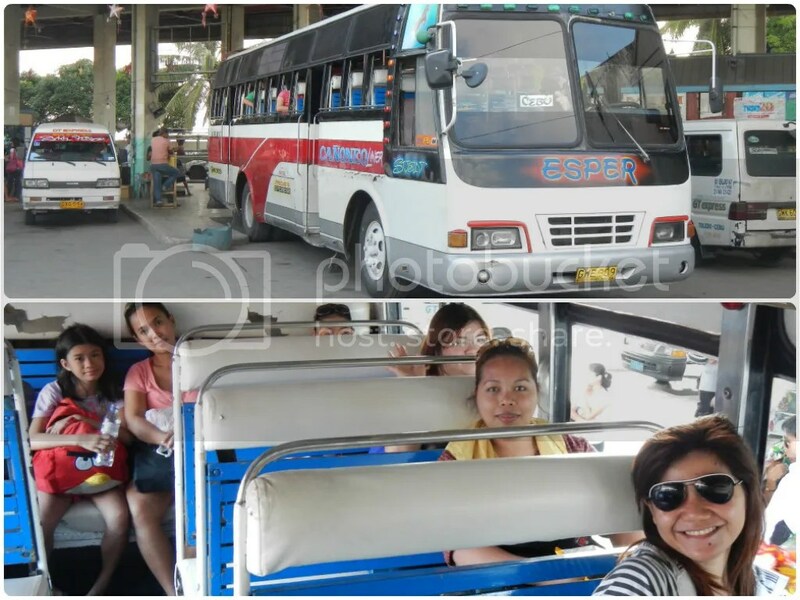 But there’s a good chance it is still relatively pristine as Aloguinsan is not as heavily visited as other places that are served by major bus liners such as Ceres. Will do. If you want, we can arrange for an ex-deal so you will get featured in Adrenaline Romance. Get in touch with us through our email at adrenalineromance@gmail.com so we can discuss the arrangement.